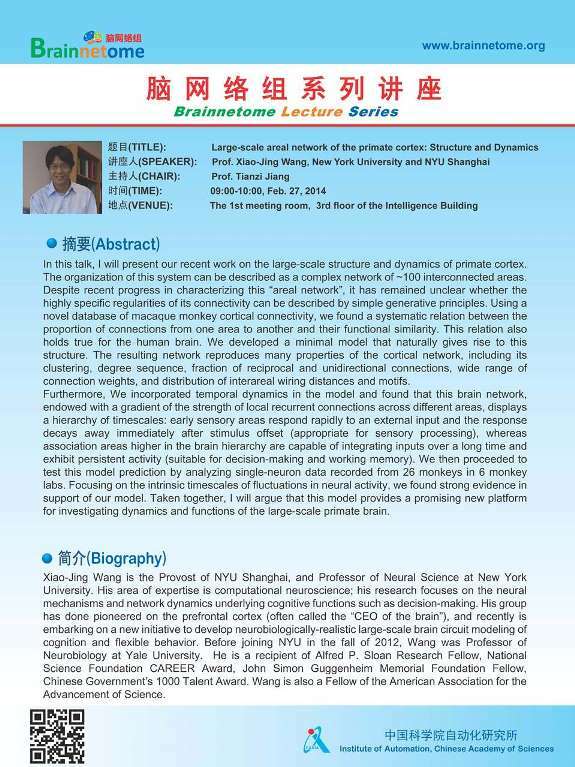 In this talk, I will present our recent work on the large-scale structure and dynamics of primate cortex. The organization of this system can be described as a complex network of ~100 interconnected areas. Despite recent progress in characterizing this “areal network”, it has remained unclear whether the highly specific regularities of its connectivity can be described by simple generative principles. Using a novel database of macaque monkey cortical connectivity, we found a systematic relation between the proportion of connections from one area to another and their functional similarity. This relation also holds true for the human brain. We developed a minimal model that naturally gives rise to this structure. The resulting network reproduces many properties of the cortical network, including its clustering, degree sequence, fraction of reciprocal and unidirectional connections, wide range of connection weights, and distribution of interareal wiring distances and motifs. Furthermore, We incorporated temporal dynamics in the model and found that this brain network, endowed with a gradient of the strength of local recurrent connections across different areas, displays a hierarchy of timescales: early sensory areas respond rapidly to an external input and the response decays away immediately after stimulus offset (appropriate for sensory processing), whereas association areas higher in the brain hierarchy are capable of integrating inputs over a long time and exhibit persistent activity (suitable for decision-making and working memory). We then proceeded to test this model prediction by analyzing single-neuron data recorded from 26 monkeys in 6 monkey labs. Focusing on the intrinsic timescales of fluctuations in neural activity, we found strong evidence in support of our model. Taken together, I will argue that this model of primate cortex is much better than the existing ones; it provides a promising new platform for investigating dynamics and functions of the large-scale primate brain.